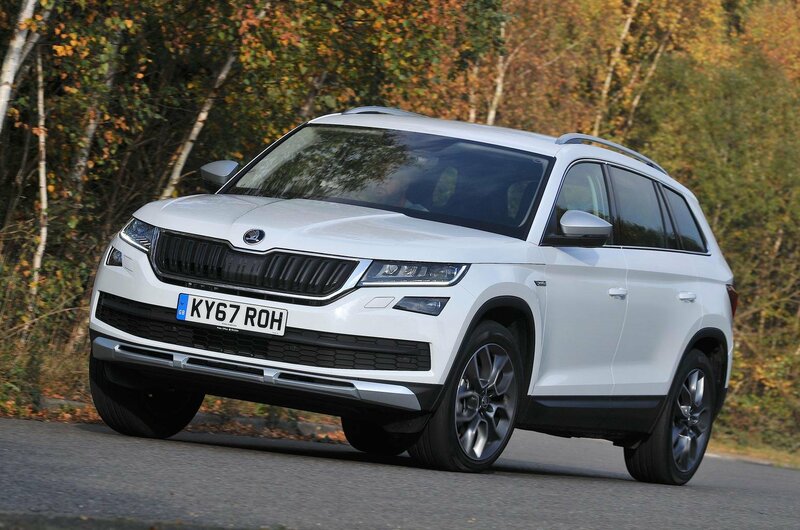 2017 Skoda Kodiaq Scout review – price, specs and release date | What Car? If we were to play a little word association with some popular products, let’s say ‘ripped jeans’, ‘sweatbands’ and, bear with us on this, ‘sports utility vehicles’, what would be your response? Depending on your disposition, answers might range from ‘ironic’ and ‘shallow’ to ‘fashionable’ and ‘on point’. It’s safe to say that the majority of car manufacturers hope that you fall into the latter camp. Because, despite the fact that SUVs have taken over the sales charts in recent years, this has come at the expense of their off-roading prowess. Expensive all-terrain hardware such as four-wheel drive, locking differentials and raised suspension has in many cases been resigned to the history books – all to ensure these family-friendly cars return good fuel economy, sport spacious interiors and are competitively priced. For the majority of buyers, this is a sacrifice worth making. But what if you need a vehicle that is competent off road as well as capable of taking the kids to school? Not everyone lives in big cities, after all. Well, you could stump up the best part of £50,000 for an entry-level Land Rover Discovery, or you might want to consider this: the new Skoda Kodiaq Scout. In most respects, the Scout is the same as a standard Kodiaq: it has seven seats, a classy and spacious interior and the option of a smooth 2.0-litre diesel engine. But, if you look closer, there are a number of key changes to enable it to cope better off road. For starters, specially designed skid plates give the Scout heavy-duty underbody protection, while four-wheel drive and an off-road assist mode that adjusts the accelerator response, dampers and diff lock to improve traction. Hill hold and hill descent control systems are standard and the Scout has fractionally more ground clearance to make it less likely that you'll bash the nose or tail on the ground when approaching and departing steep inclines. Model-specific styling accents – including silver trim around the front grille, side windows and door mirror housings, silver roof rails, tinted rear windows, 19in alloy wheels and Scout badges on the car’s front wings – round things off. If you were worried that the Scout’s extra ride height might make it less agile than the standard Kodiaq, you can breathe a sigh of relief. Direct steering lets you drive it with a surprising amount of gusto and, for a car of this size, the lack of pitch and roll is frankly astounding; neither the Peugeot 5008 nor the Land Rover Discovery Sport can match it. However, you rarely get something for nothing and so it is here. With Skoda prioritising dynamics over ride quality, the Scout is no more comfortable than the standard Kodiaq. On anything other than the smoothest roads, there’s a restlessness to the ride that is hard to ignore – an irritation compounded by the fact that we know Skoda can build an SUV that rides and handles with aplomb. Buyers can choose from all the Kodiaq engines, bar the least powerful version of the 1.4-litre TSI petrol engine. This means there are 148bhp 1.4 and 178bhp 2.0 turbo petrols, and 148bhp and 187bhp 2.0-litre diesels. We tried the 148bhp diesel, which is our favourite engine in the regular Kodiaq. It’s not the quietest diesel engine of its kind, but there is a good slug of pull low-down in its rev range and, as a result, you rarely find yourself having to work it hard. You get the choice of a six-speed manual gearbox or a DSG automatic. We would choose the latter, because it makes for a more relaxing drive. Off road, the Scout is realistically more capable than 99% of buyers will ever require. We drove on some muddy tracks and heavily rutted green lanes and the Scout tackled it all with relative impunity. In fact, it’s the Scout’s road-oriented tyres that are likely to be the most limiting factor. The Scout’s interior specification is based on the regular Kodiaq’s SE trim. 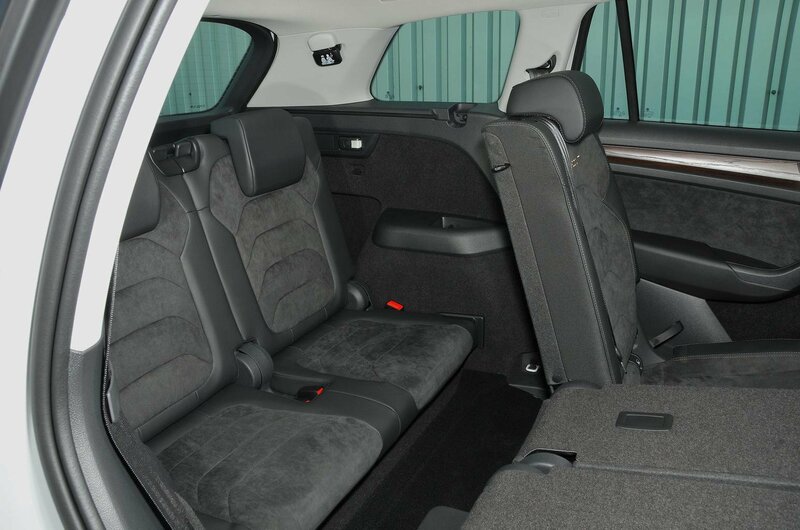 You therefore get a long list of standard equipment, including cruise control, air conditioning, LED ambient lighting, a DAB radio, an eight-speaker stereo and Alcantara seats. Those seats are wonderfully supportive and help to give the Scout an upmarket ambience. 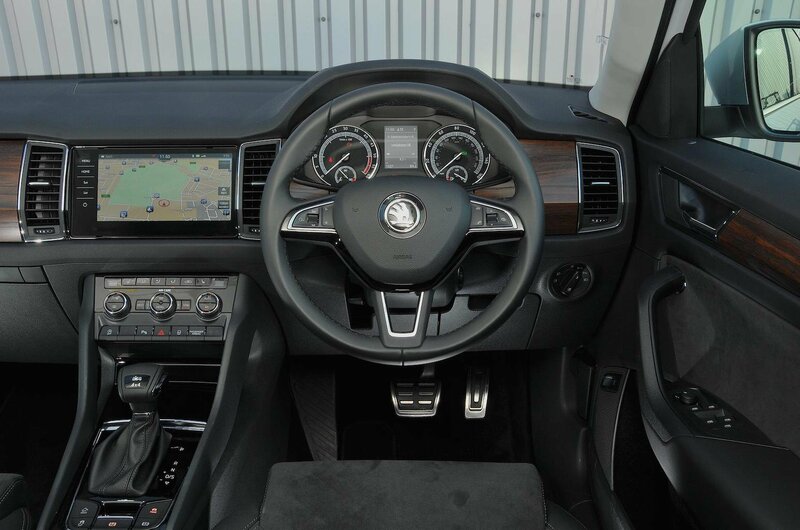 However, this is somewhat undermined by the cheap-feeling faux-wood that dominates the dashboard; for a car costing more than £30,000, you do feel like Skoda could be delivering a more premium experience inside. Thankfully, the infotainment system is much more impressive, with everything controlled through a 9.2in touchscreen that looks great and is as quick to respond as it is easy to navigate. Interior space is good in the first two rows for adults, but the Kodiaq's third row is tight for anybody other than children. 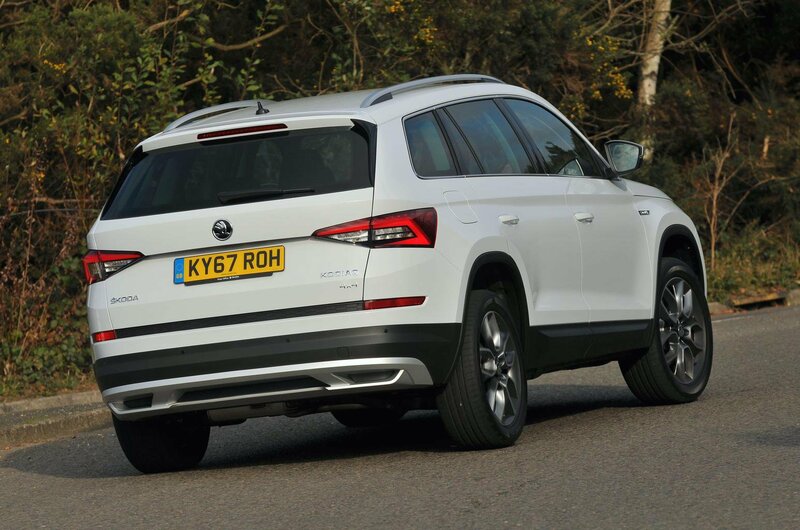 You can read more about the Kodiaq's space and practicality by heading to our main Kodiaq review.